Tired of the AI-washing and buzzword dropping? Interested in finding the connections in your data, in being able to do advanced analytics and reasoning? If you have loads of data from various sources and you want to explore how they are connected, you may want to consider graph as your data model. Graph is natural, graph is fun, graph is the best with more than 1-to-1. Graph data stores are proliferating, their capabilities are developing and their adoption is increasing. Graph data stores today are used not just for analytics, where they have always shined, but also for transactional applications and HTAP. If you want to add some structure and rules to your graph-shaped world, semantics is a key requirement. Semantics in the graph world is a bit different than what you are used to probably. To begin with, it can be as thin or as rich as you want it to. From schema-less to simple taxonomies to complex structures and rules that enable inference and knowledge engineering, the choice is yours. Options abound, knowing them is what you need to evaluate the right one for each use case. If you want to publish your graph-shaped data, or consume datasets other people publish, you need a standard to make your life easier. This is where Linked Data comes in. Linked Data is a combination of graph-shaped data with semantics attached, in a standardized way that enables interoperability. This means you can share not only data, but also schemas, and use them anywhere from your private repositories to the web. If you want to do intelligent things with your data, you will soon discover that what is sold as AI is really much more cryptic than you thought it was, and probably in more ways than you thought. AI is complex, but oversimplifications won’t help. Exercise skepticism when you hear the terms AI, Machine Learning and Deep Learning used interchangeably. And be aware that while Machine Learning and Deep Learning can get you results, explaining those results is a different story. Knowledge representation and reasoning can help. 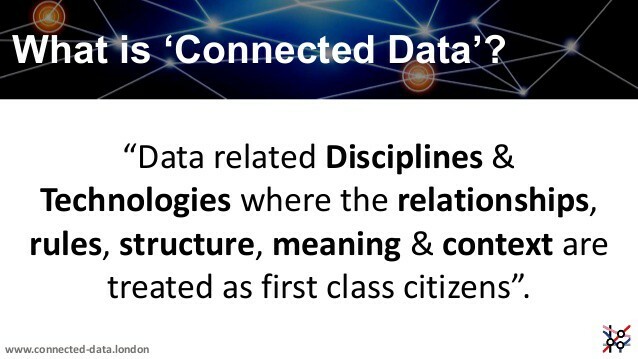 Connected Data is about bringing all of the above together. And if that sounds interesting, why not get it from the source, November the 16th in London? Get to know graph stores, their models and use cases from people using them in real life to do things such as trace supply chains for accountability, or fight financial crime. Find out about explainable AI and how knowledge representation and semantics can complement machine learning to get to the whys beyond the results, and see how connected data help publish the world’s largest knowledge base in a structured way. Discover how the latest trends and developments in software and modeling go hand in hand with connected data. With speakers from the likes of Accenture, IBM and DBPedia, Connected Data London will get you all that. Its tightly knit program with 2 tracks in 1 day is guaranteed to spoil you for choice. And with 10% discount on early bird prices, your excuses are running out. Use code GA10, get your tickets here and get with the program.